Yesterday, I remembered that my Editor wanted to see me in his Office on Tuesday, so since today is Tuesday, I showed up right on time. “Was I? I don’t think so. I think you might bee mistaken. Last Tuesday, I was busy doing something else, and I’m absolutely sure I wouldn’t have forgotten the ‘or Else’ part, probably. So, now that I’m here, what can I do for you?” I asked him. I really felt terrible for him, even if he was screaming at me. I mean, how sad is it when somebody starts having memory problems like that, when they get to a point where they simply can’t remember stuff. “I’m sorry,” I said. I mean, I’m mostly sure all of us can agree that it’s just sad when somebody has a problem like this. “Well it’s about time,” he said. “I never thought I’d live to see the day when you finally said those words to me,” he said. “Seriously? Why would you say something like that? 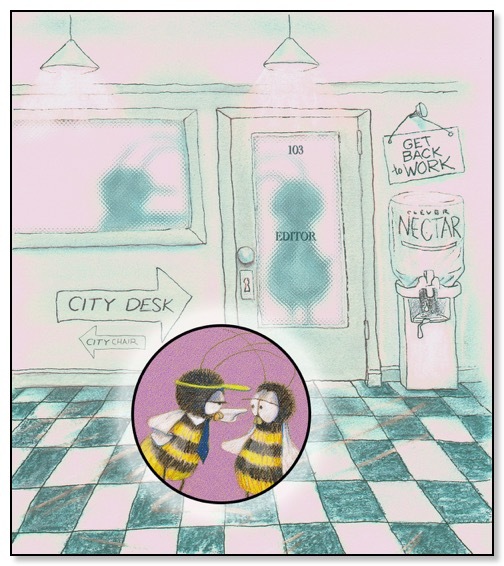 Everybody knows that I’m a highly sympathetic and compassionate bee. I can feel your pain. Why wouldn’t I bee sorry? Of course I’m sorry.” I felt kind of insulted. “What are you talking about, Bee?” he asked. He seemed confused. “What? You don’t remember? This is worse than I thought,” I said. My Editor started shaking. (I’m thinking that might bee a Symptom of his Serious Condition). “Yes,” I told him, but I couldn’t read it beecause it was going back and forth too fast. It was a total blur. “What the actual hell, Bee? Stop arguing with me, start doing your job correctly - or Else! Now get out of my Office!” he said. The fact that my Editor didn’t even remember that the “or Else” part is, as we’ve all discovered, nothing more than a Meaningless Threat has me more worried than ever about his Memory Problem. I think it’s amazingly rude to get into big arguments with somebody who isn’t Well, so I said, “Fine,”, gave him a Big Hug (which he seemed to really hate), and I left. I hafta say that I hope I never have a Problem like that, ya’ know? I’ve heard that Prevention is everything, so it’s important to watch your Diet (only the healthiest Nectar and Pollen Dishes, light on the Honey) and get plenty of Rest and Relaxation.